Tune in today to find out what you need to know and do. The Federal Budget released just over a fortnight ago incorporated a range of measures that will give seniors a financial boost. While those initiatives won't come into effect until next year, there are various changes that come into effect in just over a month that seniors should be aware of, and there are also deadlines to heed before June 30. From 12PM to 1PM today licensed financial advisers Bruce Brammall and Max Newnham will dissect the measures announced in the May Budget, and will also discuss the various changes that come into effect from July 1 this year that will impact retirees as well as those still in accumulation mode. Click here to register for our free live webcast, Dissecting the May Budget, and send in your questions to our Adviser Q&A panel. You can either send your questions beforehand, or during the webcast. What those in superannuation accumulation phase, and those in pension phase, need to do before June 30 this year. There's just over five weeks to the end of this financial year, so time is of the essence. The new laws coming into effect from July 1 this year, and what you need to know to take advantage of them. They include some changes to concessional contributions, the new home downsizing legislation, and more. The measures announced in the latest Federal Budget, and what they mean for retirees. These include changes to the Pension Work Bonus and the Pension Loan Scheme. 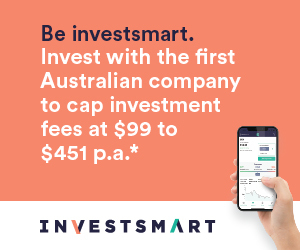 The Intelligent Investor Equity Income Portfolio is now available as a listed fund trading under ASX code: INIF. Holdings in the Fund will mirror the Equity Income Portfolio, has the same low costs, but you can buy it on the ASX. You can save yourself the broking by applying during the initial offer. Offer closes Friday, 8 June, 2018.